Triaxial Testing Equipment | Soil Strength Test - Gilson Co.
Triaxial testing of soils provides valuable soil strength and shear information for safe and effective design and construction of embankments and foundation systems. Build the optimum system for your application by selecting from Gilson’s Load Frames by Karol-Warner, Master and Auxiliary Control Panels, quality Test Cells and test accessories. Technicians prepare and mount undisturbed or remolded specimens in a test cell pressurized with water to create a confining pressure around the specimen. The test cell is placed in a Pro-Loader Load Frame to gather information about shear resistance, strength and cohesion, and to predict slope stability and structural foundation behavior. Tests can be conducted with specimens in unconsolidated-undrained condition using ASTM D2850 methods, consolidated-undrained in accordance with ASTM D4767, or consolidated-drained conditions meeting ASTM D7181. Triaxial Test Cells are used with Karol-Warner Pro-Loader Frames, and can be adapted to other equipment. Triaxial Cell Accessories are designed for use with Gilson's Karol-Warner Pro-Loader Frames and Control Panels, and are available individually or as part of a complete set of products used in triaxial testing. 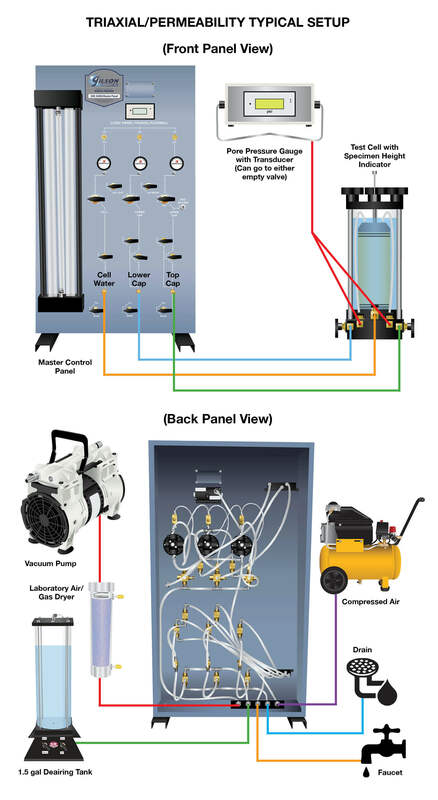 Triaxial Control Panels regulate and monitor air and fluid pressures in the Test Cells through a system of burettes, valves and regulators, and can also be used for hydraulic conductivity/flexible wall permeability testing of soils. Master or Auxiliary Control Panels offer greater flexibility to set up your system. Triaxial Load Frames are used for loading of specimens for triaxial testing and meet ASTM standards. Load & Displacement Measurement products are available in either digital or analog options, and measure load and sample displacement during triaxial soil testing in accordance with ASTM D2850, D4767, and AASHTO T 297. Triaxial Data Acquisition Software works with the Load and Displacement Kit to record specimen and real-time test data, calculate results, then prepare reports following ASTM and AASHTO requirements. Sample Preparation products include the items needed to prepare soil samples for triaxial testing.